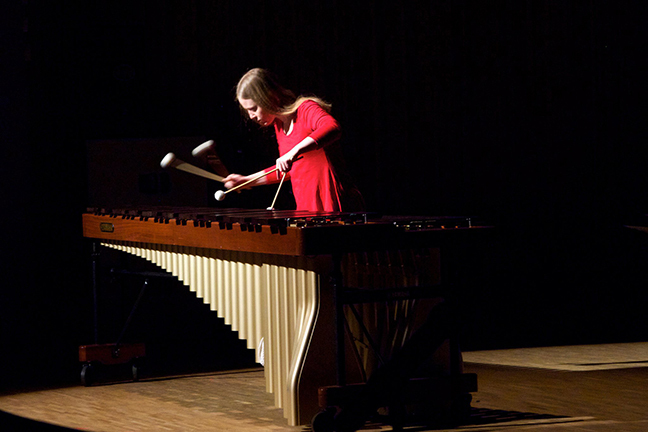 Ellen Sjö Sander, Gothenburg based marimba soloist, plays both existing pieces from the ”traditional” marimba repertoire, and new pieces written specifically for her, including world premiers by Anna Eriksson and Ylva Lund Bergner. In her music, Ellen seeks to expand the limits of what is possible to do with the marimba and to enlarge the repertoire by exploring the instrument together with different composers. A big incentive is to reach that magical feeling when everybody in the room is completely engulfed in the music. Ellen Sjö Sander has studied classical percussion at the Academy of Music and Drama at the Gothenburg University, with teachers Einar Nielsen and Daniel Berg among others. The studies were mainly focused on solo marimba and percussion in contemporary music.